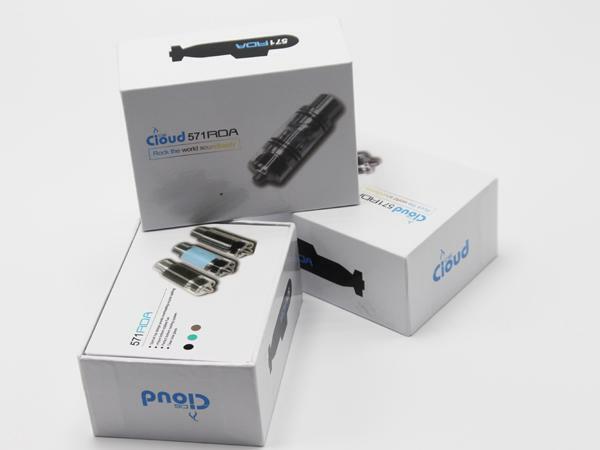 I’ve been a fan of iCloudCig for a while. I really like the Fishbone RDA and I’m looking real hard at the Fishbone Plus. My good friend Powerband from the ECF sent me the 571 RDA. He said he thought I might enjoy playing around with it. The box is a pretty standard affair. Glossy cardboard with logos, website addresses, certifications, and features. This device comes in stainless, blue, and black. I have the black one. What’s with the sudden surge in tiffany blue? Was there a tiffany blue paint fire sale at a Sherwin Williams in China? Inside there’s a foam bed with a cutout for the RDA itself, a cutout for the spare stainless barrel, and a cutout for the spares packet. Note that there is NO REPLACEMENT for any of the glass. You break it, it’s broke and that’s all she wrote. There is the steel barrel, but I’ll likely never use it because I like to see the condition of my wicks… that’s why I’ve picked up 3 glass topped RDAs thus far. The 510 center pin appears to be solid copper and is adjustable. You could use this on a hybrid mod, but I think the additional length and contacts between the center pin and the positive post would negate any benefit you might derive from doing so. Above the 510 is a removable plate with three scalloped holes for air. If that plate is removed (and it can’t be left off, or, rather if it is left off, the RDA will look even more ridiculous than it already does), access is granted to the fan and the glass surrounding the fan. 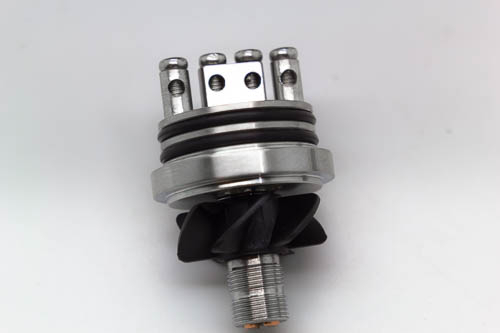 The fan is removable, and is not on any kind of ball-bearing center. It just spins on the center post. Some reviewers have said that in order for the fan to spin it should be kept dry. That’s not going to happen. Between the bottom airflow of the deck above the fan and the condensation, it’s gonna get wet. The glass surrounding the fan is just a simple ring of glass with no o-rings on the top or the bottom. Be careful setting it up and taking it apart because there are no replacement pieces for this. It might have been interesting to see the entire bottom turbine section made removable so that the RDA and the turbine could function separately. Above the turbine assembly, is the RDA itself… the important bits, anyways. 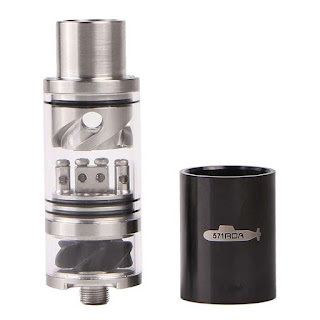 The top cap is a two piece affair that is held on by two o-rings on the bottom and the mouthpiece is attached with one o-ring on the top. The mouthpiece is seriously different. You’re not going to drip into this because it’s got a bottom plate in place to prevent spitback. Instead, the airflow enters above that base through four large holes bored into the sides of the mouthpiece. The air is guided into those holes through four sloping scallops on the outside of the mouthpiece. Cyclonic, they call it. Hmmm…. You’re not going to use your own drip tip on this one as there is no adapter and no other chuff I’ve tried will fit. Including an adapter would have been a nice touch, here. The deck is a pretty standard four-post deck with a dogbone shaped juice well, two milled-in-to-the-deck negative posts, and two Fishbone style airholes under each coil, The juice well, being dogbone shaped, is not going to hold a lot of e-liquid, but it isn’t shallow, so it will hold some. The post holes are large enough to easily accommodate up to the 24 gauge wires I used in this build (dual 24 gauge nichrome, eight wraps on a 2.5 mm mandrel, .25 Ohms), and I believe it would likely hold 22 gauge. So, does it vape? 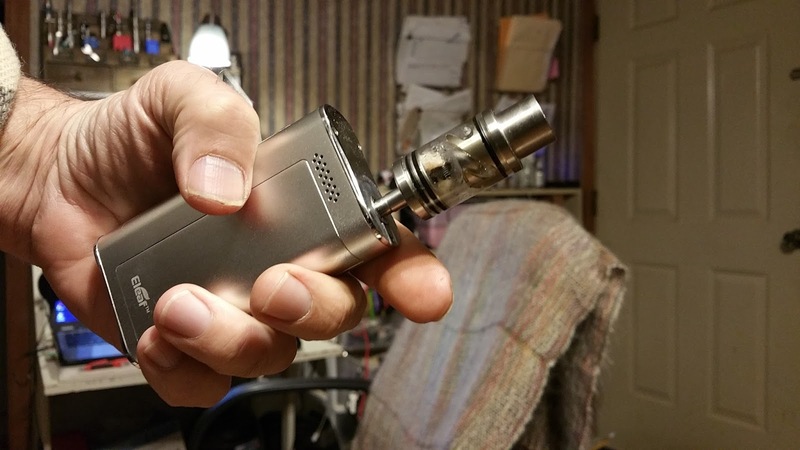 Surprisingly enough, it vapes quite nicely - if a little noisily. The flavor isn’t even that bad. Can’t use your own drip tip. Form 7/10 - This is entirely subjective, but if I wanted to carry something as big as a Subtank, I’d want it to carry some e-liquid. Being able to convert it into a standard, non-turbine RDA by removing the entire base would have made a difference..
Function 8/10 - As ridiculous as it looks, it does provide airflow with no spitback. The mouthpiece never gets hot. The mod never gets hot, either. It vapes, it vapes cool, it vapes well.. Final - 8.3/10 A decent B grade.